PC Tools will soon release iAntivirus security software for Mac users. The product displays a Mac-like simplicity and elegance, yet with powerful features that catches and removes known malwares in real-time. 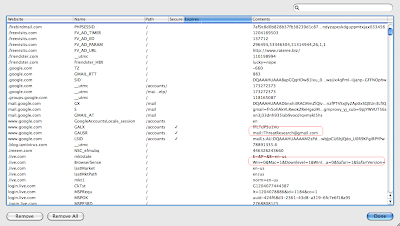 A good example here is Trojan DNSChanger. 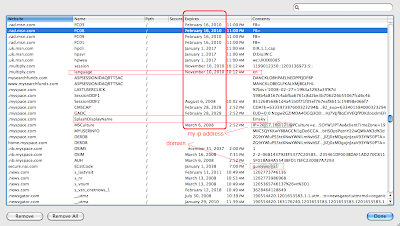 This threat has been in the internet for more than four months now and it's continually eluding security analyst by changing its domain names, IP addresses and ways in delivering this trojan to mac users. 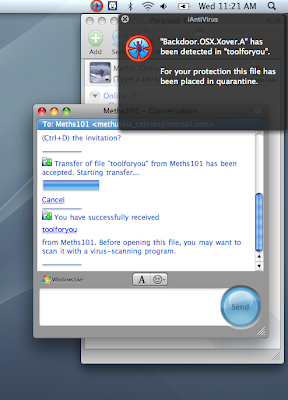 iAntivirus on-guard catches this threat in real time. Let say someone you know or close to you sent you a file through messenger. Without your knowledge, the file is a Backdoor server component which the sender wishes you to install so that the client component which is on the attacker side could perform unauthorized task to your machine. Here's the impressive real time catch of iAntivirus. In our daily computing activities, USB flash or portable drives plays important role in storing, exchanging and transferring files. You often get out of control when too much files are stored and worst if one day you are dragging malicious files to your local hard drive. Perhaps, a keylogger running in background. Are you excited to have a copy of this? 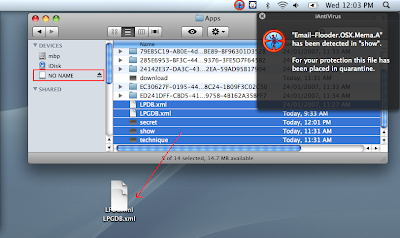 Then drop your email address and we will notify you once iAntivirus beta version is available. Which browser have anti-phishing features? 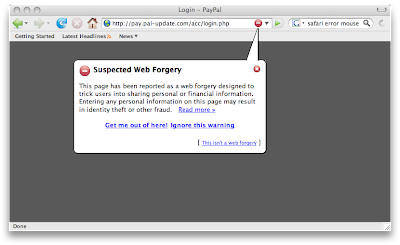 Yes, this is true Safari 3.1 is not capable of detecting phishing site and this is where PayPal is most worried about - because they are always targeted by phishers. Notice the two screenshots above, obviously Safari does not recognize anything while Firefox displays an alert message. Base from last year report, Anti-Phishing Working Group receives an average of 25,000 new phishing sites per month and 91.7% of this attacks are related to Financial Services. Safety Filter - It prevents known malicious sites from loading. However, this feature does not work in my testing. Perhaps, they are still working on it. 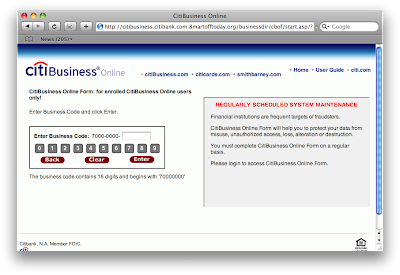 Domain Name Highlighting - As shown in the example below, the real domain name is not citibank.com instead it is 8martofftoday.org. 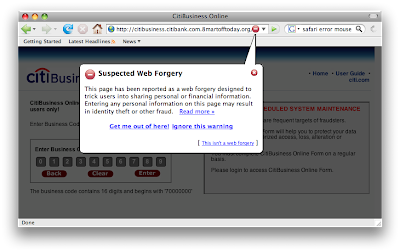 Absolutely, a phishing site! 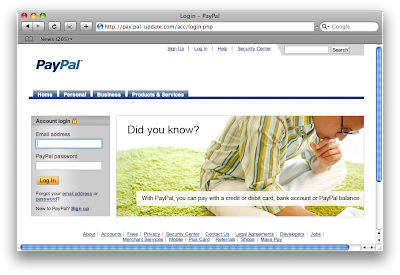 This feature is also available in Mozilla plug-in "Locationbar&sup2". Mozilla Firefox 3 Beta 1 was previously announced and this version provides more security features including "Malware Protection", "Anti-virus Integration" and "One-click site info". Check the full release notes here. The continuous proliferation of threats in the internet has escalated user's security awareness. And this, factors into users' expectation that softwares and application should provide security features. Beating up threats is just like a rat race and whether this is users' problem or not, the trend is now pressuring Safari to blend in.